Another Lent is upon us, so we did it up right this year. Joined by friends Danielle and Rubén, I spent a week at Mardi Gras. New Orleans’ version of Carnival fills the city and surrounding areas with weeks of parades, parties, music, food, drink, and all sorts of excess. Carnival means “farewell to the flesh”, so Fat Tuesday is the last hurrah. It is the day to indulge yourself in pleasure, since Ash Wednesday is the first day of Lent, a 46-day time of atonement and non-indulgence. This is why Carnival season – and especially Fat Tuesday – is full on drinking, dancing, partying, and indulging in meats and sweets (such as King cake). 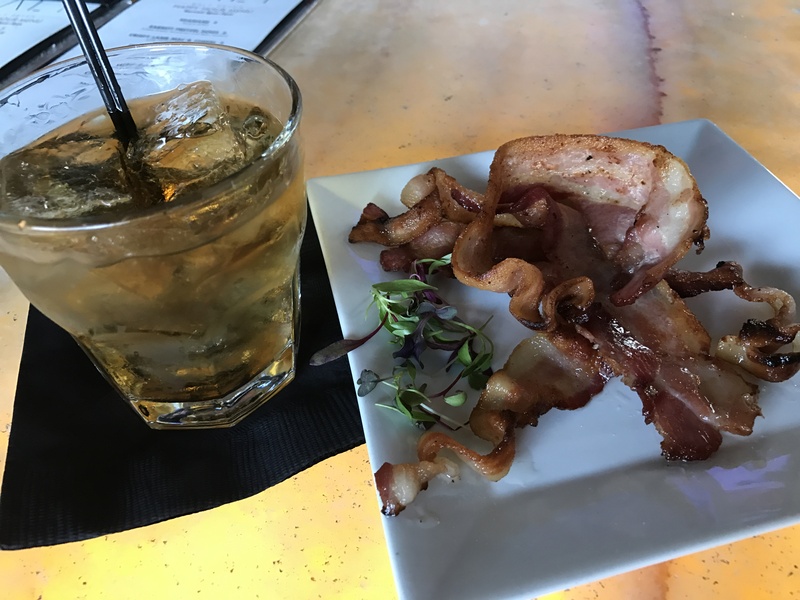 Since I give up bacon (and sometimes more) during Lent, I’ve decided to end Fat Tuesday enjoying something that pairs well with bacon – a fine bourbon. Thanks to Larry & Christian for the bacon, Brooke & Josie for the bourbon, and Salt7 for the fantastic venue. And last but not least, Angel’s Envy for making such a fine product. 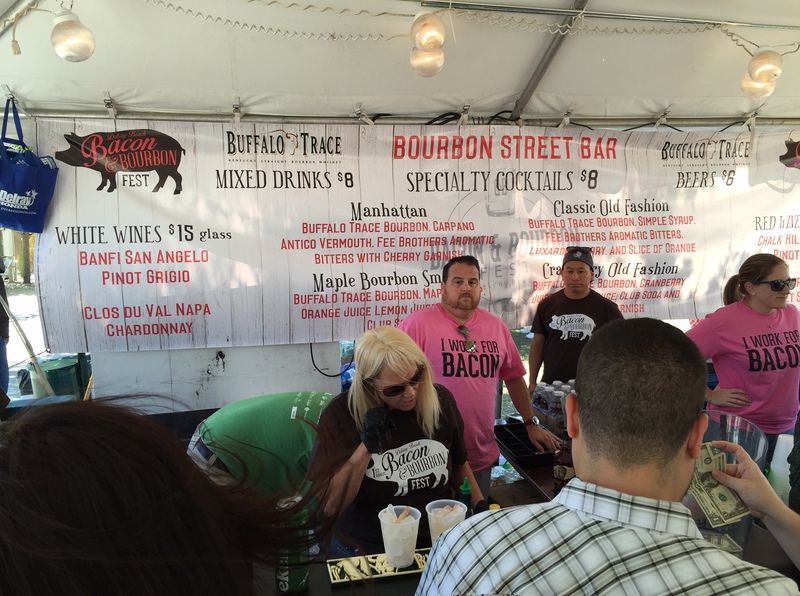 March 29th was the 6th Sunday of Lent, and it was also the 2nd day of the inaugural Delray Beach Bacon & Bourbon Fest. 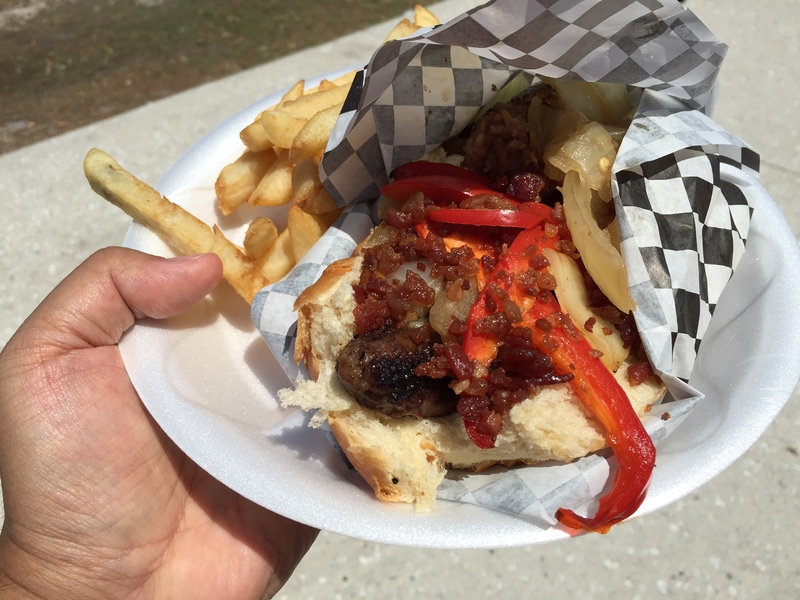 I was out-and-about in Delray Beach on Saturday, but since Sundays don’t count during Lent, I waited until the 2nd day of the festival to attend so I could enjoy some yummy bacon. Since I heard the festival was a sell-out on Saturday and that they may have temporarily run out of bacon, I decided to make some for breakfast before leaving the house. 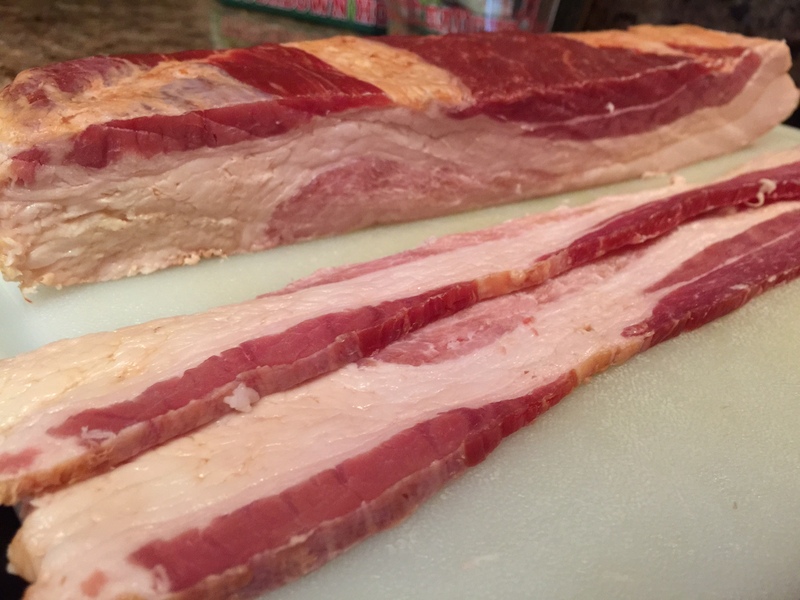 Of course, I sliced up some of the best bacon in the world, Nueske’s Applewood-Smoked Bacon – sliced it up thick, of course. Again, thanks to Larry from Salt7 for the Nueske’s bacon! 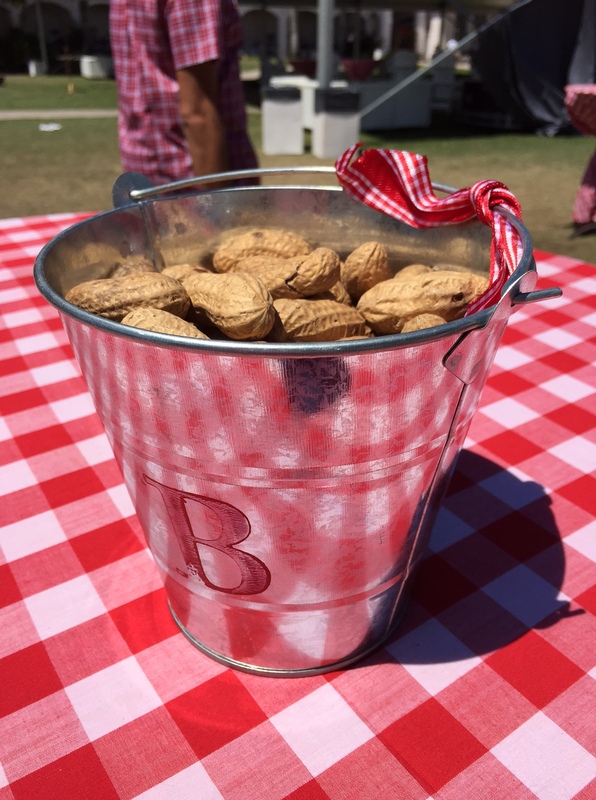 The first things we saw after walking in are buckets of peanuts at every table (nice touch) and the Fireball Whiskey booth. 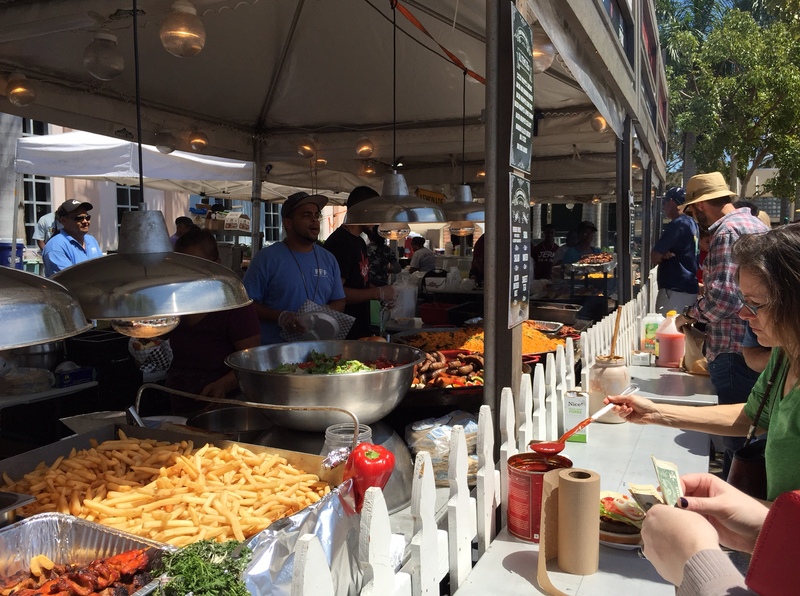 We’d be returning to that booth… several times. Because we heard the lines at the bars were long on Saturday, we decided to knock that out first. Specialty cocktails were $8, and bourbons were $16 and $20. Next was the food. 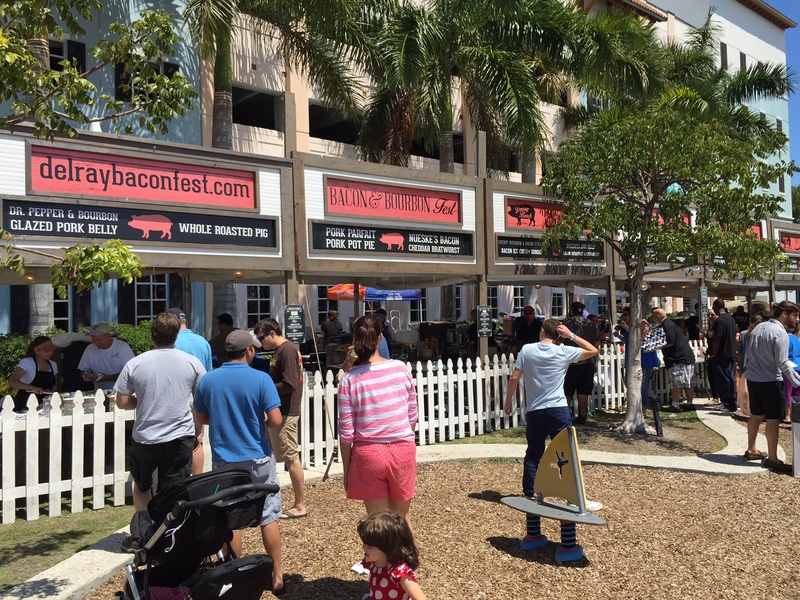 The booths reminded me of Delray Beach’s Garlic Fest, but instead of garlic, everything had bacon. Time for another drink. 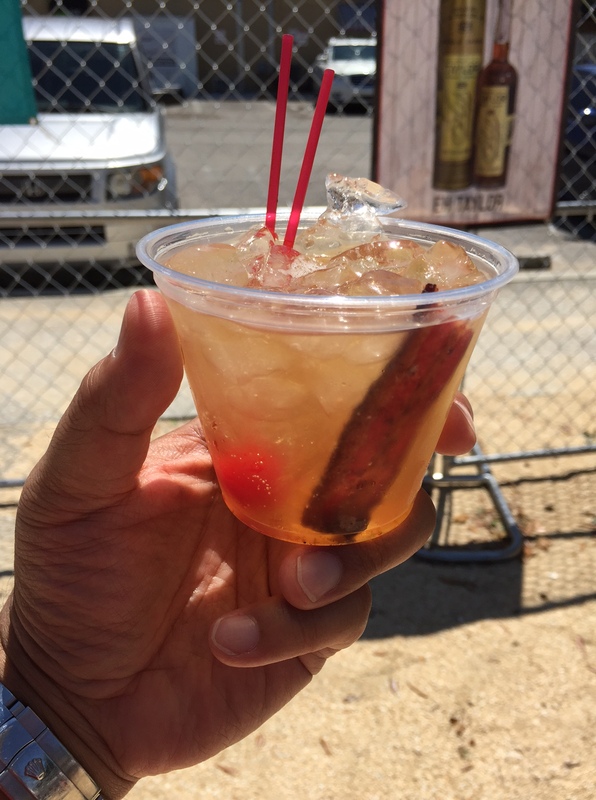 Instead of waiting in line at one of the main bars, I went to the Smoke Inn booth where they were serving up maple bacon old fashioneds. 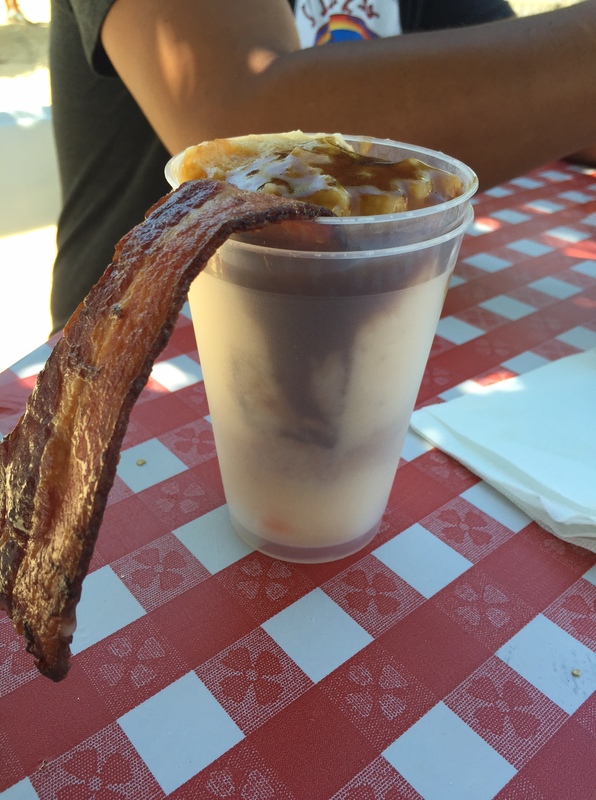 When I got back to our table, I found that Javier just got a bacon parfait – that’s mashed potatoes and pork belly topped with gravy. Looked good enough to eat! Now it was time to meet Cheryl from Nueske’s, the title sponsor of the festival. She was attending with her friends Ann and Marjorie. 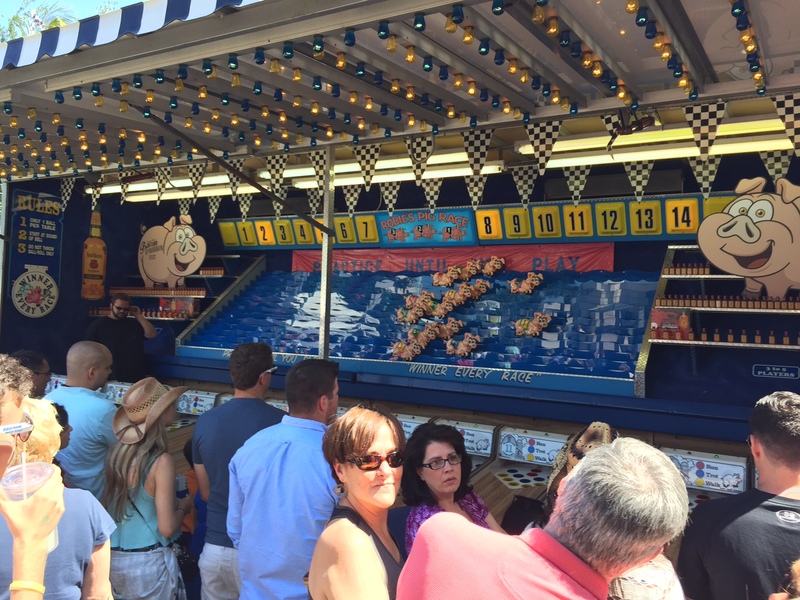 We also checked out the pig races – winner gets a small bottle of Fireball! 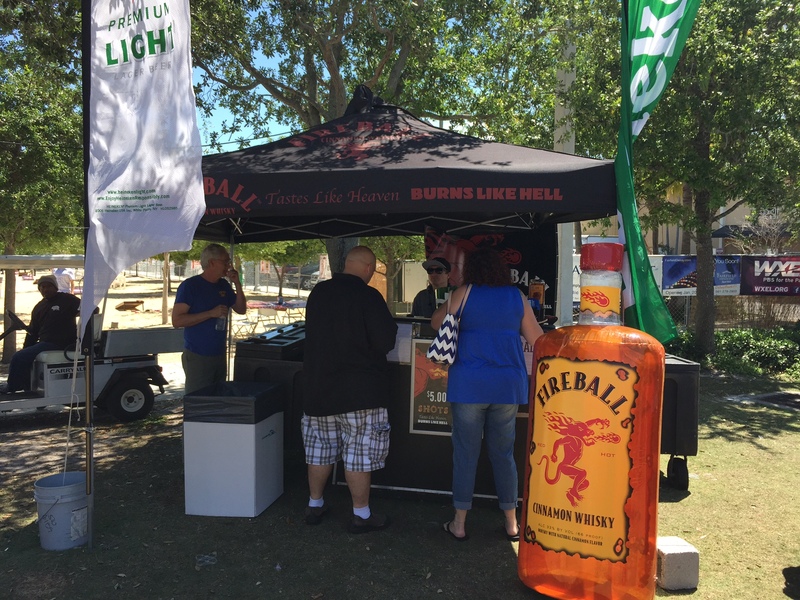 We decided not to wait in line to play… we just hit the Fireball booth again and paid for shots. 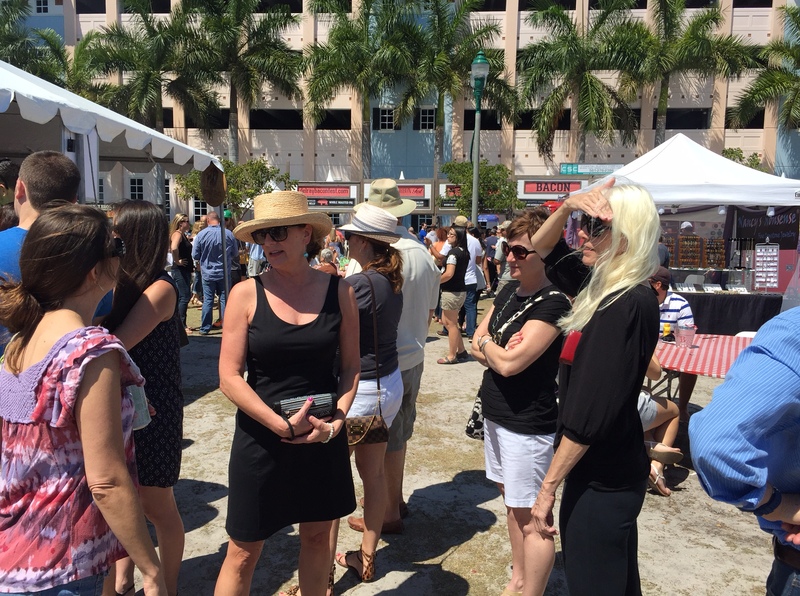 All-in-all, we thought Delray Beach’s first attempt at Bacon & Bourbon Fest was a fun time. 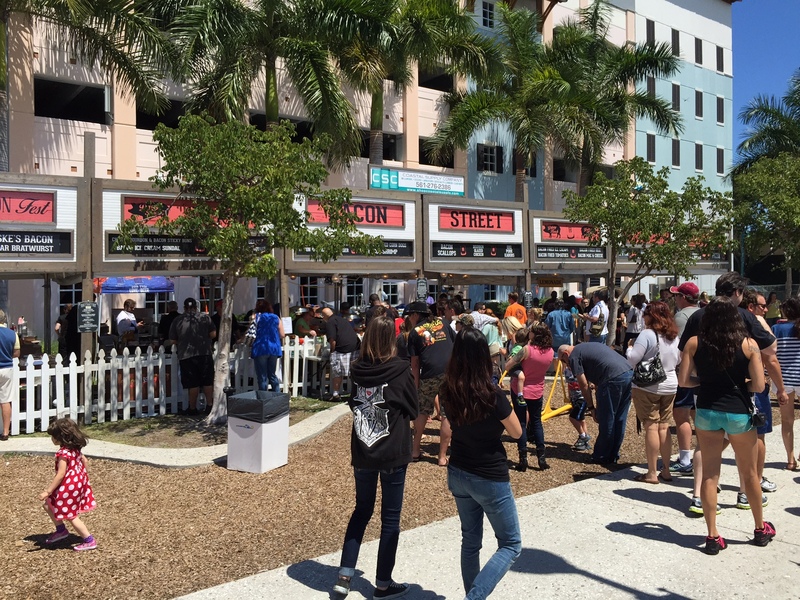 I think all the negative comments I read after the first day came from people who were denied entry because they didn’t purchase tickets online before the event. Everything I read about the event said to buy tickets early, and that there would be a limited amount of tickets available at the gate. So next year, buy your tickets online everyone! This is it, everyone. 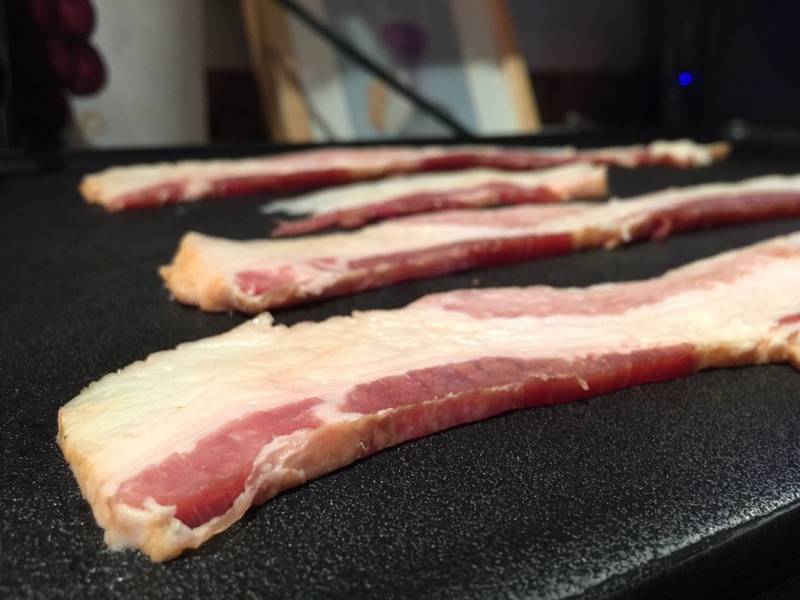 What the New York Times called the “beluga of bacon, the Rolls-Royce of rashers”… Nueske’s Bacon. 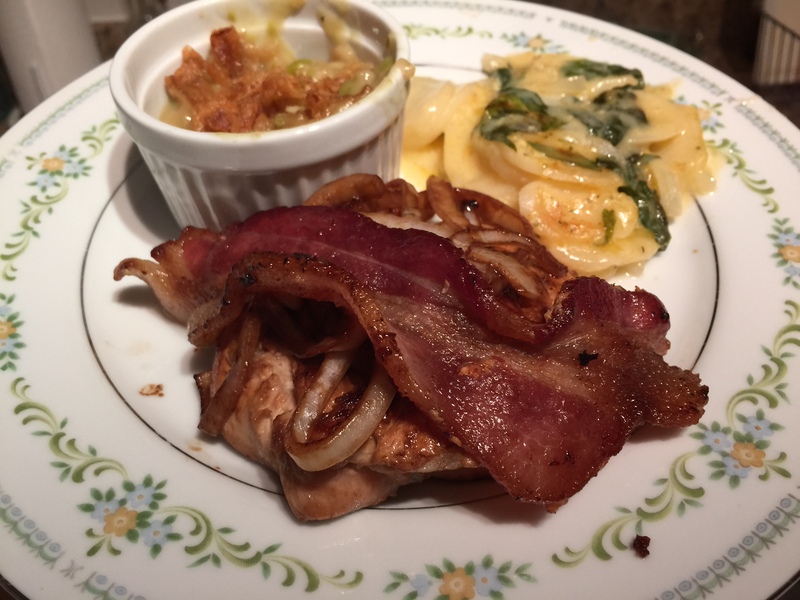 Nueske’s is a specialty meats supplier out of Wisconsin whose tagline is “The World’s Best Applewood-Smoked Meats” – that alone is enough to make your mouth water. 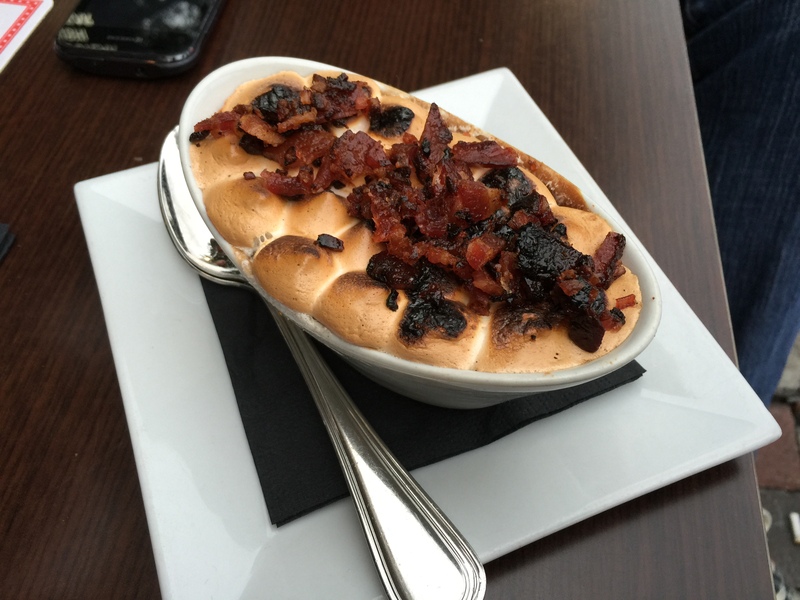 So, my old friend Larry, the GM at Salt7, knows all about my trials and tribulations of giving up bacon for Lent. He also knows that Sundays don’t count during Lent (maybe because I told him), so what does he do yesterday? 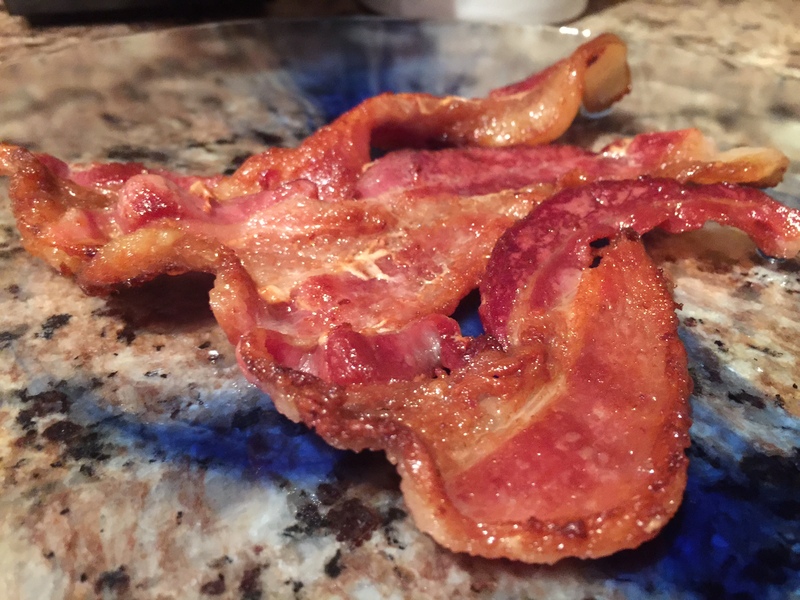 He gives me a slab of Nueske’s Applewood-Smoked Bacon to take home and enjoy today, that’s what! This piece of uncut meat smells so sweet and savory, I almost didn’t want to slice it. But when I did, I made sure to slice it nice and thick – thicker than you’ll ever find in any store-bought bacon. 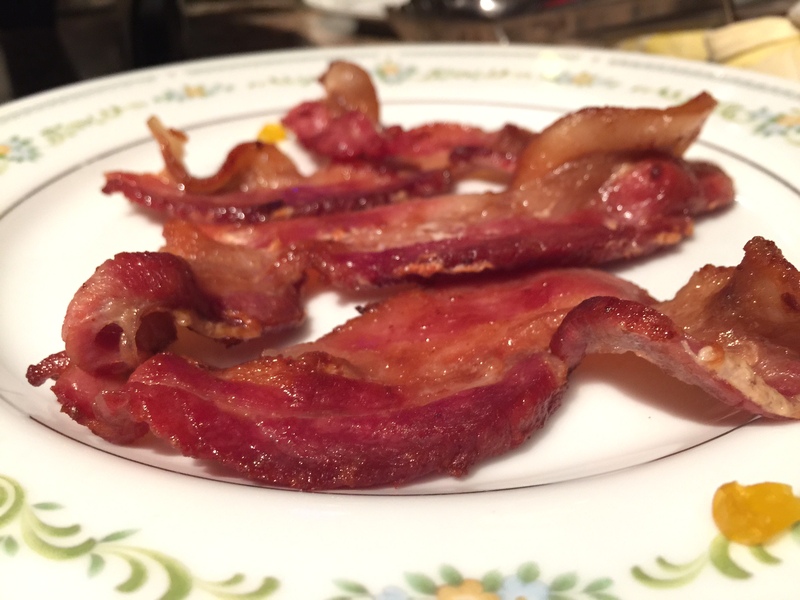 I noticed the difference while cooking the bacon too – higher-quality bacon does not exhibit a lot of far runoff, and doesn’t shrivel up into nothingness. The thickness of the cut also deters curling. What you end up with is nice meaty chunks of bacon goodness. So what did I do with all these amazing bacon? I decided to top our dinners with it – that night’s being grilled chicken. That huge piece of bacon almost covers an entire chicken breast! 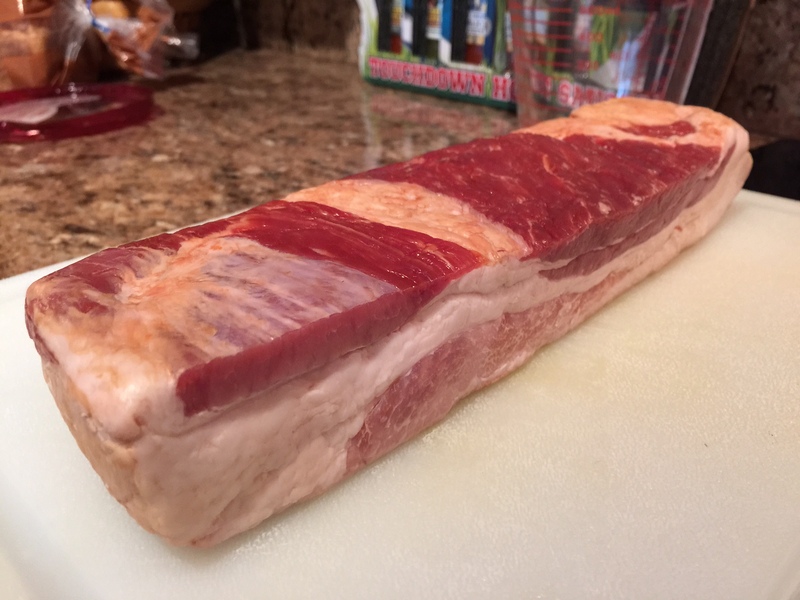 And I’ve got a lot of uncooked bacon to spare… what to do for next Sunday…. 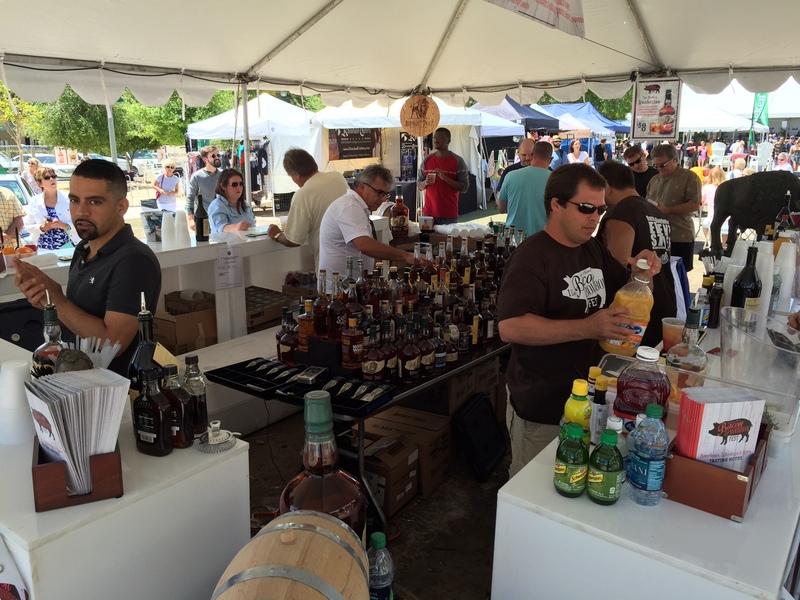 Oh – just to remind you: Nueske’s is the title sponsor for this weekend’s Delray Beach Bacon & Bourbon Fest… don’t miss it! Thanks again Larry and Salt7! 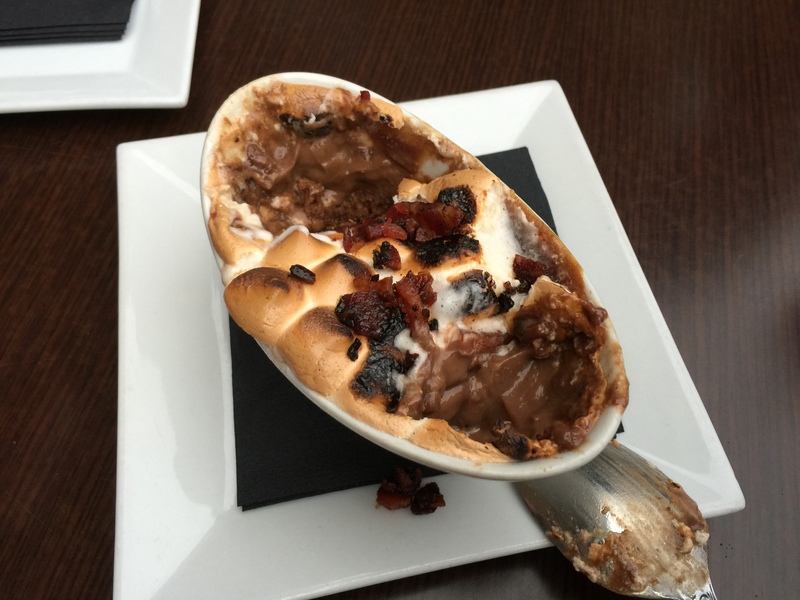 Their Bacon Crème Brûlée has broiled marshmallows and applewood-smoked bacon on top of a chocolate custard/pudding, all on top of a graham cracker shell. 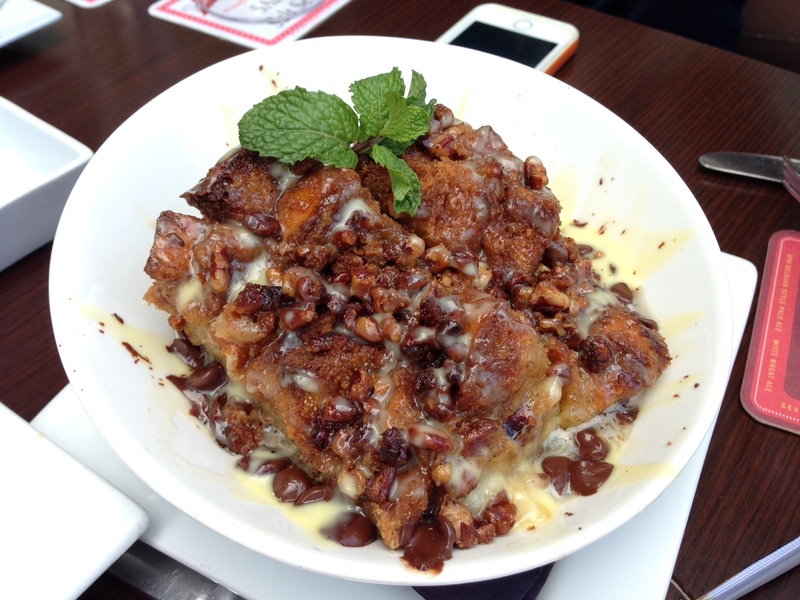 That’s Salt7’s Jack Daniels bread pudding. Nothing else needs to be said. Instead of pondering over what kind of breakfast meat to eat today, I decided to wait a couple hours and have a late breakfast – or early lunch – at my favorite Tuesday place, Tijuana Flats. Like many restaurants, they have a “taco tuesday” special. There’s is called “Tijuana Tuesdaze” – 2 tacos, chips, and drink for five bucks and change. 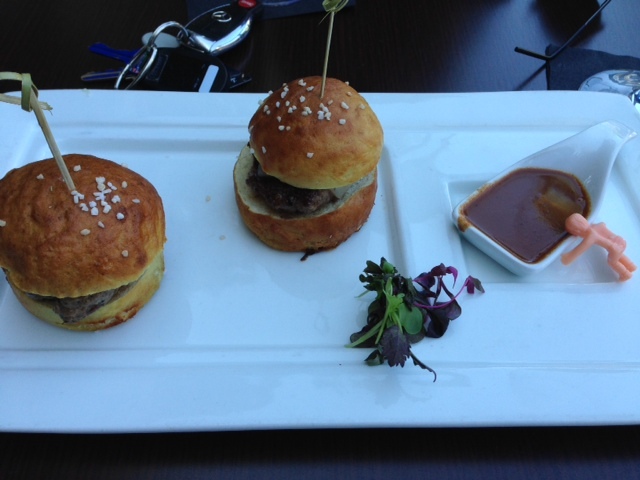 Add a draft beer and your looking at eight bones… not bad! 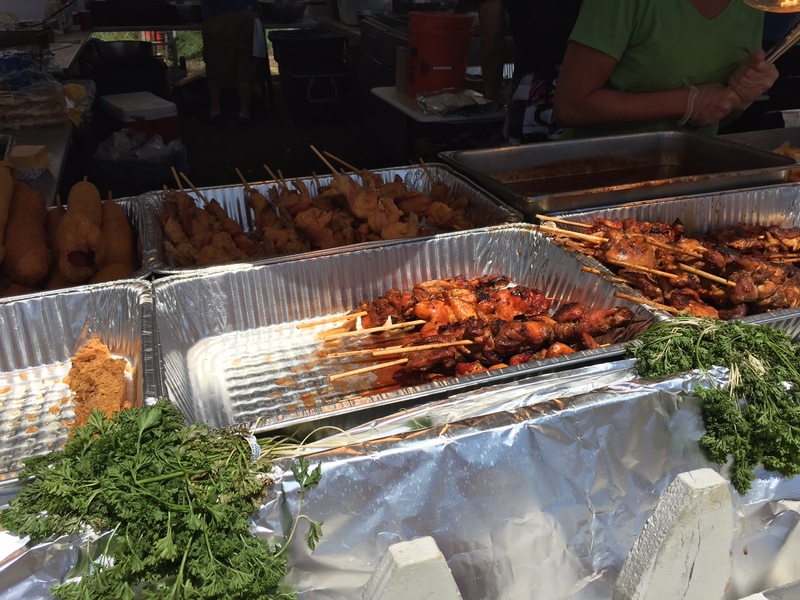 Bonus – you have 15 hot sauces to choose from, and none of them are made of bacon. That damn sauce is so good, I’d put it on anything. 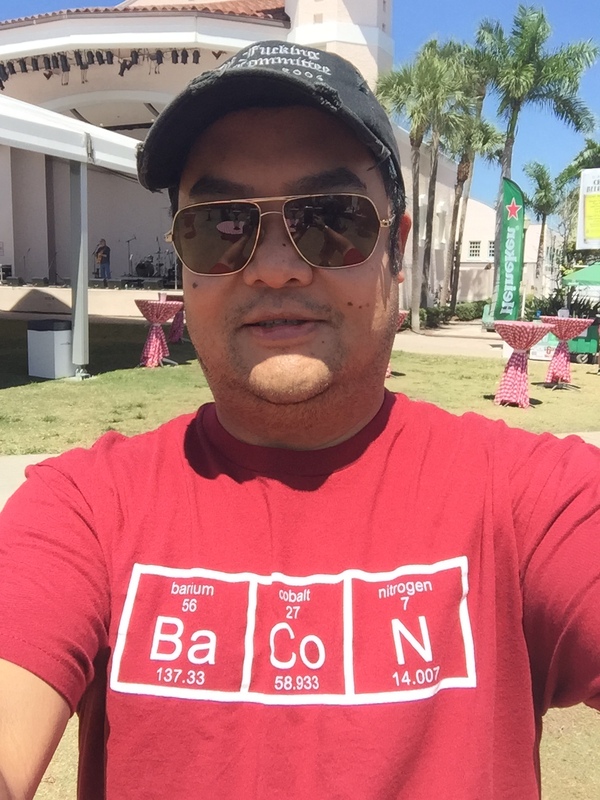 I wonder what how bacon would taste dipped in the stuff…well, I guess I won’t be able to find out for another 40 days or so.